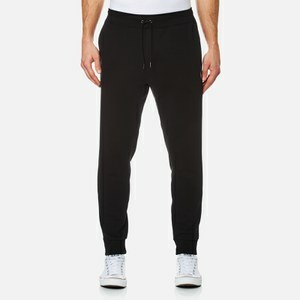 Men's sweatpants from Polo Ralph Lauren. Cut from smooth cotton interlock for comfort, the jogging bottoms feature an elasticated waist with internal drawstring, a sewn fly and contrast striped panels to the outside leg. Articulated stitching to the back of the knees enhances movement, while functional zipped cuffs allow for extra ventilation. Finished with a zipped pocket to the rear. Signature pony emblem embroidered to the left thigh.